Stephen Marche may have once been first to admit that the title of this compact, entertaining, and informative book is a bit of a stretch. No matter. He has come to believe the hyperbole justified. Not for scholars, How Shakespeare Changed Everything is a funny and accurate representation for the general public of how the plays of William Shakespeare have influenced all of us by connecting ideas and concepts found in Shakespeare’s works—social, political, and religious—to subsequent historical events long after these ideas were first staged during England’s Elizabethan period. Some connections are tenuous, such as the assassination of Abraham Lincoln by Shakespearean actor John Wilkes Booth—influential but not necessarily causal. Other connections are more solidly linked, such as amateur ornithologist and Shakespeare aficionado Eugene Schieffelin releasing imported starlings into New York’s Central Park in 1890 because he wanted every species of bird mentioned in Shakespeare to be present in the United States—thus unleashing a plague of filthy pests that, ironically, soiled even the venerable head of the park’s statue of Shakespeare. The most profound effect of Shakespeare, Mr. Marche points out, is his inventive use of language; everybody quotes him, even without knowing they are doing so. More sinned against than sinning, loved not wisely but too well, vanished into thin air—all these are derived from Shakespeare. Other ways author Marche says Shakespeare changed everything is in the matter of religious tolerance, racial equity, the virtual invention of teenagers, and sexual liberty—among many others. Shakespeare, it seems, was way ahead of the curve. Elizabethan audiences may not have tolerated a mixed-race marriage in reality, but it doesn’t take long for them to sympathize with Othello when he has to justify how he wooed his wife Desdemona. It is significant that they despised Iago (named after a Spanish conquistador who persecuted Native Americans and was much in the news of the day) for driving a racial wedge between the lovers. Another area where Mr. Marche maintains Shakespeare influenced subsequent social issues was that of religious tolerance, quite a hot potato under Elizabeth l’s reign. The Tim Lehrer ditty, “The Catholics hate the Protestants and the Protestants hate the Catholics and the Hindus hate the Muslims and everybody hates the Jews,” pretty much sums up the religious landscape in the 16th century. Enter the character of Shylock, who in many respects is a stock character as in Christopher Marlowe’s The Jew of Malta, but in Shakespeare there is a difference: Shylock is not a complete villain; he is a wronged man seeking justice. He gives voice to a whole peoples’ frustration with not being allowed to work in any field but money lending and is then condemned and distrusted by society for making a living at it. In his frustration, he crosses the line and asks for a pound of flesh as security on a loan. Abominable? Yes, but Shakespeare manages to make him sympathetic, thus, whether intentionally or not, firing a literary salvo at antiSemitism. This is why Shakespeare endures on stage longer and farther than any other playwright. The Jew of Malta is rarely performed, but The Merchant of Venice is—and fairly continually somewhere in the world at any given moment. Mr. March’s discussion of who Shakespeare really was is of great value. His conclusion is that we do not and cannot know; there is simply not enough hard evidence out there. Lacking such evidence, we must turn to his plays to find him, but they are inconclusive. How is this valuable? It points to an approach to writing that is surprisingly contemporary. Shakespeare was, as a playwright, so willing and able to subrogate himself under the characters who populate his dramas that it is impossible to know what Shakespeare actually believed about anything. Mr. Marche spends considerable time talking about why Leo Tolstoy hated Shakespeare, but turns the arguments on their heads. What Tolstoy saw as deficiencies—lack of moral clarity, failure to credit God or blame him for the frankly messy world created—are actually the playwright’s greatest strengths and why he has been venerated all over the world in many languages for four centuries. Shakespeare had no agenda. He was able to allow his characters and their actions to speak for themselves—and he did not judge them. In that, his work is quite at home in the 21st century. He seems like one of us. Like Dostoyevsky, Shakespeare was able to put convincing arguments into his character’s mouths, even if he personally disagreed with them. This, Mr. Marche insists, is the mark of true genius: Opinions and personality disappear behind the work. One other note: Regarding whether or not Shakespeare wrote Shakespeare, Marche puts a rather sizable nail in the coffins of conspiracy theorists who suggest it was anyone else. He maintains it was impossible that anyone but Shakespeare could write Shakespeare. Teleological? Maybe. But I’ll let you read the book to see how Mr. Marche supports this contention. Ultimately, it doesn’t matter whether the title is justified or not. 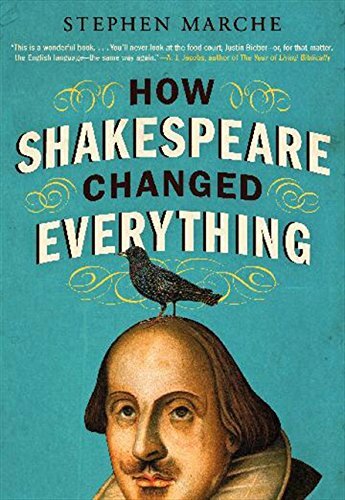 How Shakespeare Changed Everything is fun and informative, with more than its share of “Aha!” moments packed between its diminutive covers. Mr. Marche’s thesis is compelling and probably more true than we ever imagined.